"A basic banana muffin with crunchy topping. Fat free! I prefer organic applesauce." Preheat oven to 375 degrees F (190 degrees C). Grease 12 muffin cups or line with paper liners. Whisk 1 1/2 cup flour, baking soda, baking powder, and salt in a bowl. Beat bananas, 3/4 cup brown sugar, agave syrup, egg, and 1/3 cup applesauce in a separate bowl until thoroughly combined. Stir banana mixture into the dry ingredients to make a smooth batter. Fill muffin cups about 2/3 full of batter. Mix 1/3 cup brown sugar, 2 tablespoons flour, and cinnamon in a bowl; stir 1 1/2 teaspoons of applesauce into the mixture until it resembles coarse crumbs. Sprinkle topping over muffins. Bake in the preheated oven until lightly golden brown and a toothpick inserted into center of a muffin comes out clean, 18 to 20 minutes. 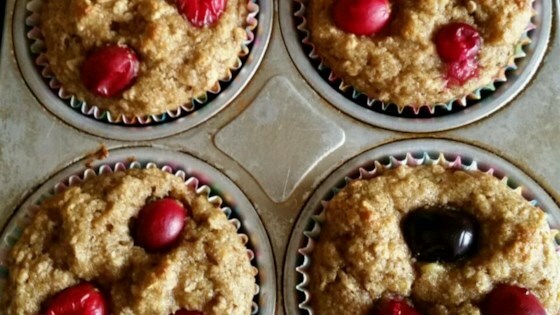 The crumb topping makes these muffins extra yummy. Since packed brown sugar is not as sweet as white sugar, I added a tablespoon of agave honey/syrup. The bananas were very ripe (the skin was already brown) so if the bananas you have are not that ripe, you might want to add more agave syrup. I live in Yucatan's peninsula so preheated the oven at 150°C. If you live in a non-altitude place you might have to bake 20°C to 30°C less than what the recipe calls for. These came out really nicely...I had to use more applesauce and less bananas because I ran out. They are really sweet and dont even taste "healthy"! Even though I used whole whaeat flour. These were very good muffins!! !